I've always been a huge fan of The Body Shop and it was one of the first brands I ever tried when I first started getting into beauty products. I feel their products are a little more luxurious than drugstore brands but they're still very reasonably priced. 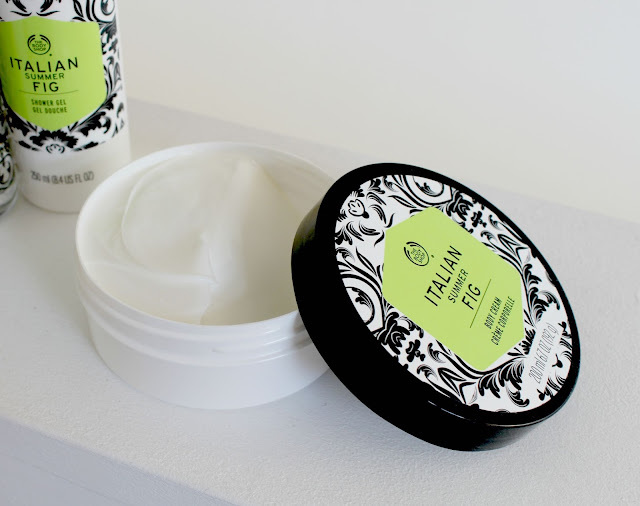 The body butters have always been a favourite of mine as they're so hydrating on the skin and smell amazing too! 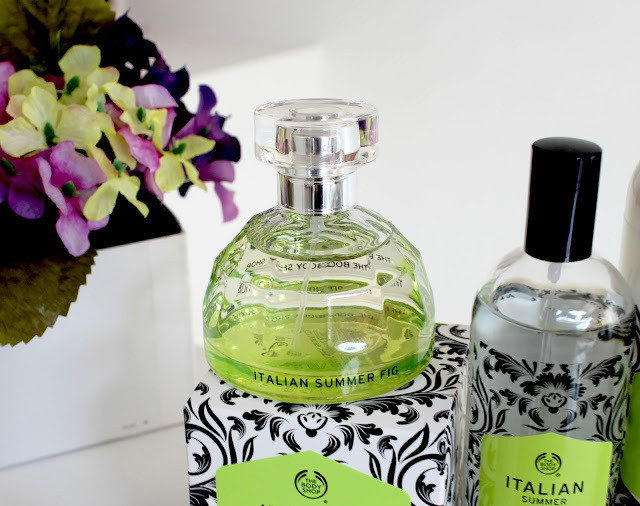 I was very kindly sent the new Italian Summer Fig range* from Shopcade, an amazing one-stop shop for all the best beauty and fashion discounted items, including The Body Shop. The new range includes a shower gel, body cream, body lotion, body mist and Eau De Toilette. 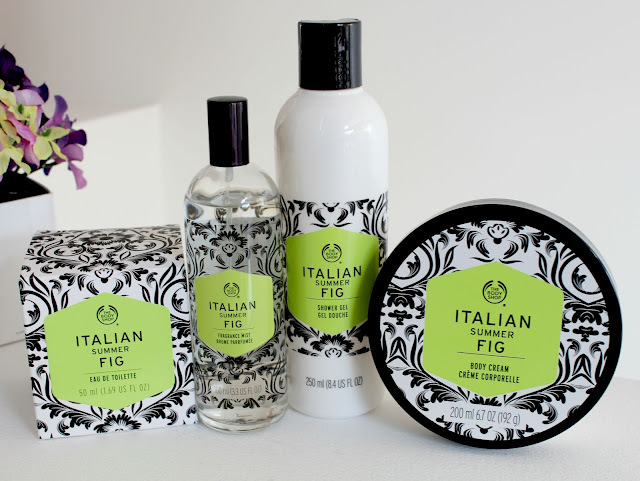 I was lucky enough to receive all of the products minus the body lotion and as I'm a huge fan of figs and fig scents in general, I was excited to try them out. I have to say that fig is usually a scent I'd associate with candles / reed diffusers and not body products but I like that it's something a little bit different to the usual super fruity scents I wear. I'm utterly useless at describing scents but I really love this one - it's really fresh without being overpowering. It's not like any other fragrance I own and I'd say it sits somewhere between fruity and floral. The main scent is obviously figs so if you don't like figs then this one might not be for you. Scent aside, these are all high quality products and I always feel a little luxurious when using them. The body cream would have to be my favourite from the range as it's really light on the skin whilst still being super hydrating and it doesn't leave any sticky residue. I actually prefer this formula to The Body Shop's body butters as it's a lot easier to apply after a shower in the morning than a thick body butter that takes a while to sink in. The shower gel is great to use before the other products as the scent lingers on the skin but I can't really say much more than that as most shower gels do the same job. As long as they keep me clean and smell good, I'm happy. The body mist and perfume both smell amazing as I mentioned earlier and they make a great combo when worn together. 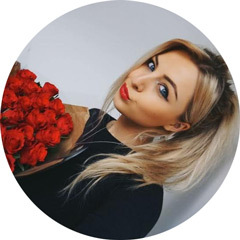 The body mist is something I'll get a lot of use out of as it's great to freshen up with throughout the day and allows me to save my more expensive perfumes for evenings out or special occasions. However, because The Body Shop is so reasonably priced, I'd be happy to use the Eau De Toilette layered over the body mist on a daily basis too. Overall I'd say this is a lovely range of products and one I'd highly recommend trying out. I also think they'd make a lovely gift as they all compliment each other really well. I went into the body shop the other day and smelt this and it was INCREDIBLE. I am such a sucker for all thing fig smelling! This range is lovely i tried the blue one and that one is awesome! The packaging of this range is gorgeous! I definitely want to try some of these products, they sound lovely. Believe it or not, I've never actually tried the Body Shop! I will definitely have to! :) X.
I love The Body Shop! This stuff sounds amazing! I need to add it to my collection i think! This sounds so dreamy, although when I buy the entire range I am not sure my bank would agree! This body shop pack are look like very beautiful,i want to buy this body spray,cream,lotion etc to gift my friends.